and all those who dwell among them. “And you shall proclaim release throughout the land for all its inhabitants” (Leviticus 25:10). לְקַיֵּם הַנְּבוּאָה הָעַתִּיקָה, ”כִּי־אָמַרְתִּי עוֹלָם חֶסֶד יִבָּנֶה“ (תהלים פט:ג). and end the Occupation swiftly in our days. And fulfill the ancient vision that “the world will be built on love” (Psalms 89:3). Tonight begins Yom Kippur. We are asking our community, when you say the prayer for Israel this Kol Nidre, will you say it for all the people that live in Israel and Palestine? Will you stand for freedom and dignity for all Palestinians and Israelis? Our members have reimagined the Prayer for the State of Israel. We hope you use this New Prayer for Israel and Palestine, and share it with your own community. 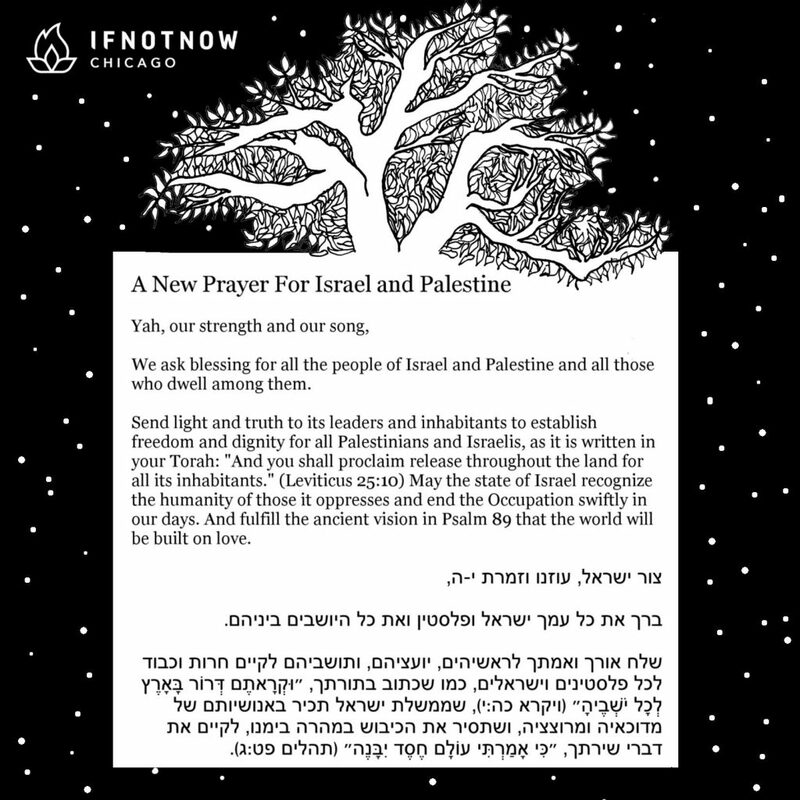 “תפילה לישראל ופלסטין | Prayer for Israel and Palestine by IfNotNow-Chicago (5778)” is shared by IfNotNow Chicago with a Creative Commons Attribution-ShareAlike 4.0 International copyleft license. Please reciprocate for any adaptation or redistribution of this work by (1) properly attributing the work to IfNotNow Chicago, (2) clearly indicating the date you accessed the resource and whether any changes have been made (and if so, please be in touch with us and leave a comment below so that we might note your adaptation or improvement), (3) providing a link back to this source, and (4) specifying the Creative Commons Attribution-ShareAlike (CC BY-SA) 4.0 International copyleft license under which this work was shared. 2018-10-27 – 18 Heshvan 5779 at 2:02 pm · Reply.